The top is a bread box, the lower bins store potatoes and onions. Measures 39"H x 18"W x 11-1/2"D. Order hardware and bread box decal separately, or see Special Offer which includes the plan, the hardware and the decal. 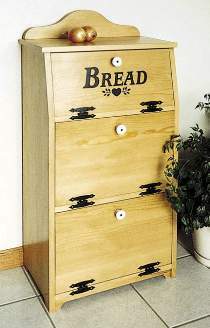 Bread Box Cabinet Hardware Package includes six colonial "H" Hinges, three ceramic knobs and a 7" lid support. Bread decal not included in the hardware package.